People outside of your Customer Engagement apps organization, such as your partners. People inside and outside of your company. All redirected emails retain the original sender context, such as Customer Engagement apps (crmoln@microsoft.com). If you have been added as an additional recipient, and you want to stop receiving email notifications, please contact your Customer Engagement apps admin. If you’re not sure who your Customer Engagement apps admin is, see: Find your Dynamics 365 for Customer Engagement administrator or support person. 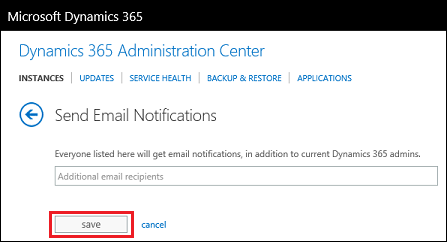 By default, Dynamics 365 for Customer Engagement apps admins will receive update notifications. You can add others to receive update notifications. 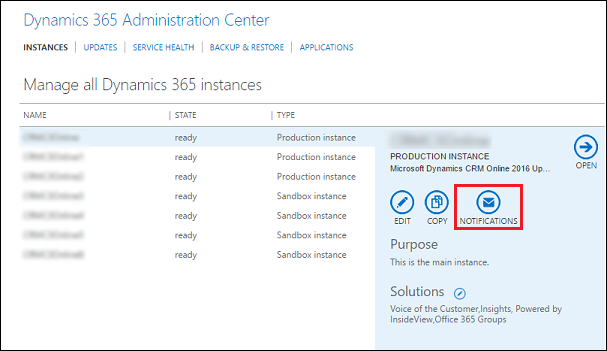 On the Office 365 menu bar, click Admin centers > Dynamics 365 > Instances tab. Choose an instance that has notifications you want to change. Enter the email addresses of people to receive update notifications for the selected instance and click Save.